OverDrive | Where are my holds? To find titles you've put on hold, go to your library's OverDrive website, click or tap , then select Holds. You'll need to be signed into the site to get to this page. From your Holds page, you can see all of the titles you currently have on hold, borrow available holds, edit your email address for hold notifications, suspend a hold, or remove a hold. 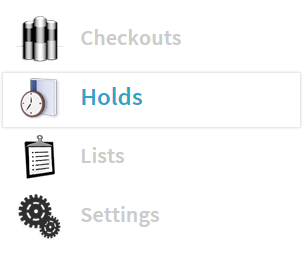 If you'd like to adjust your automatic hold checkout settings, go to your Settings page (also under ). Sign into your Account from your library's OverDrive website. Select Holds to see all titles you currently have on hold. From your Holds page, you can also turn on/off automatic hold borrowing, edit your email address for hold notifications, suspend a hold, or remove a hold.